The Star Trek franchise was at its high peak in 1994. Later that year came Star Trek Generations, which was supposed to be the start of a new film era starring the characters from Star Trek: The Next Generation (TNG), but instead signaled the long, slow decline of the franchise. Let’s get to the point and have it known that the only great thing about the seventh Star Trek film was Captain James T. Kirk (William Shatner). By himself he nearly saved the film. 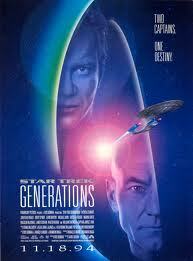 That is because Star Trek Generations only seemed to come to life whenever he appeared, which was to bookend the film. It begins with the christening of a new Federation starship: the Enterprise-B. Joining the celebration are former crewmembers of the Enterprise-A, Kirk, Chief Engineer Montgomery “Scottie” Scott (James Doohan) and Commander Chekov (Walter Koenig). Kirk is clearly uncomfortable being at this Enterprise, since he isn’t in command and is reminded of how empty his life has become. These are magnificent scenes with superb acting by William Shatner. He doesn’t have many lines but you could see on his face that longing to sit in the captain’s chair again. Clearly, retirement doesn’t suit him well. The captain of the vessel is John Harriman (Alan Ruck), who seems a bit like a dweeb. He isn’t a bad person, just too cautious and inexperienced. How did he get this prestigious assignment? Perhaps he’s related to someone important. The Enterprise-B is officially launched from Earth orbit for a quick tour of the solar system and back. But the ship receives a distress call from ships with El-Aurian refugees. Harriman is hesitant to commit the ship, but as with your typical Star Trek plot inconvenience, even though they’re in Earth’s solar system, there aren’t any nearby ships that can help. Reluctantly, Harriman orders the ship to warp over to the refugees’ location. Upon arrival, they find two ships caught in the gravity field of the nexus ribbon. It’s a swirling, flaming band of energy that oscillates and spews out tendrils of energy, which destroys one transport ship. Harriman is clearly out of his depth and asks Kirk for help. Kirk, Scotty and Chekov spring into action. Scotty manages to beam aboard some refugees before the last ship explodes. Chekov assembles a makeshift medic crew to help the survivors. One of them is a hysterical mad man (Malcolm McDowell) who is begging to go back to the nexus. Chekov helps another refugee who turns out to be Guinan (Whoopi Goldberg), the ancient bartender seen on TNG. The Enterprise-B becomes trapped in the same gravity field. The only means of escape is to fire an energy pulse from its deflector array located in the engineering hull. Harriman volunteers to modify the array but Kirk realizes that the Enterprise-B isn’t his ship. He tells Harriman to remain on the bridge and leaves to work on the array. Kirk makes the modifications and the ship pulls free, but not before an energy tendril strikes the engineering hull, which causes a hull breach. The film jumps ahead 78 years later from outer space to tranquil ocean waters and a quaint sailing ship named Enterprise commandeered by officers in old-fashioned naval uniforms. The entire thing is a simulation on the Enterprise-D’s holodeck. The senior Enterprise-D crew members including Captain Jean-Luc Picard (Patrick Stewart), First Officer William Riker (Jonathan Frakes) and the android Lt. Commander Data (Brent Spiner) are celebrating the promotion of their Klingon crewmate Worf (Michael Dorn), who is dunked into the water. 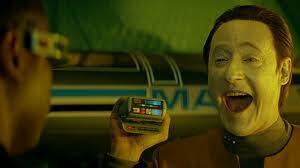 Data is perplexed by the humor of the situation especially after his attempt at humor fails to produce laughs. Captain Picard then receives a personal message from Earth and becomes gloomy for most of the film. Moments later, the ship gets a distress call from the Armagosa Observatory. The Enterprise-D heads to the Armagosa system and the floating observatory, which was attacked. The crew find a survivor in the observatory, a scientist, Dr. Tolian Soran, who happens to be the same lunatic rescued on the Enterprise-B. Meanwhile, Data tells his friend Chief Engineer Geordi LaForge (Levar Burton) that he feels stunted regarding his attempt to grow as a sentient being. He wants to experience emotions and has Geordi implant an emotion chip into his brain. Later at the Ten Forward lounge, Data begins to experience emotions after sampling a drink offered by Guinan. Data then acts like a buffoon for most of the film. 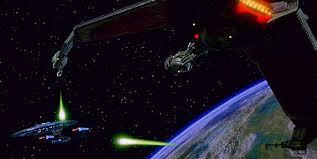 Investigations uncover that the Romulans attacked the observatory because they were looking for trilithium. It’s an unstable compound developed by them that can stop nuclear fusion in a star. It’s revealed that Soran is building solar probes with the compound to collapse stars because he wants the shockwaves to alter the course of the nexus towards a planetary body. After failing to convince Picard to let him return to the observatory, Soran goes anyway there and kidnaps Geordi, who was there to investigate the attack. Data was with Geordi but is so overcome with his new emotions that he can only cower in fear when confronted by Soran. The scientist then launches a solar probe with the trilithium at the Armagosa star. In his quarters, Picard tells Counselor Deanna Troi (Marina Sirtis) why he is so morose. His brother and nephew died on Earth and he is despondent over that and the realization that he is without any family. Before the scene can devolve into an intergalactic episode of Dr. Phil, they witness the collapse of the Armagosa star. The Enterprise-D crew manages to rescue Data and leave the system, but Geordi and Soran are beamed aboard a Klingon bird-of-prey ship. Soran is working with the commanders of the ship, the ugly and annoying Duras sisters Lursa (Barbara March) and B’Etor (Gwynyth Walsh) who appeared on TNG. They stole the trilithium from the Romulans and gave it to Soran to develop a weapon for them. The Klingon ship leaves for the Veridian system, where Soran can continue his work. Back on the Enterprise-D, Picard learns about Soran and his plan for the nexus. It’s made of temporal energy (don’t ask) and is actually an interdimensional realm where time has no meaning and you can live out your fantasies. Soran was briefly there before his rescue by the Enterprise-B and desperately wants to return. 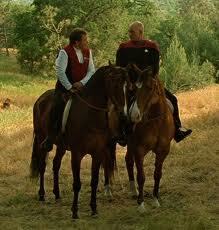 Picard and Data deduce that with the nexus will now travel to the Veridian system. If that star is collapsed, the shockwave will push the nexus towards a nearby planet Veridian III. Picard orders the ship to head to that planet. Once they arrive, they are challenged by the Klingons. Wanting to get Geordi back, Picard offers a prisoner exchange and has himself beamed down to the planet where Soran is already working on another solar probe and launcher. When Geordi was held captive, Soran modified Geordi’s VISOR device that allows him to see. Once Geordi returned to the Enterprise-D, he unknowingly helps the Klingons because they can now see through his VISOR. 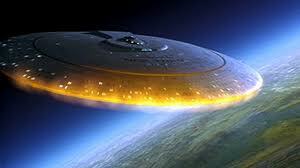 After discovering the Enterprise-D’s shield frequency, they attack the larger ship. Even though its shields are penetrated, the Enterprise-D manages to destroy the Klingon ship. But the warp core is damaged and about to explode. Riker orders an evacuation to the saucer section and has it separated from the ship. The Enterprise-D explodes and its shockwave causes the saucer to crash land onto the surface of Veridian III. Meanwhile, Picard fails to stop Soran, who launches the probe. The Veridian star collapses and causes the approaching nexus to reach the planet’s surface. On a mountaintop, Soran triumphantly holds up his arms as he is absorbed into the nexus along with Picard. Then the shockwave from the star destroys Veridian III, killing all the crash survivors. Afterwards, Picard finds himself in an idyllic fantasy world taken from the works of Dickens, complete with a loving wife and children and his nephew. Guinan soon appears and tells him he’s in the nexus. Picard wants to leave the nexus to stop Soran and asks for her help. She tells him that she isn’t the real Guinan but some kind of psychic remnant left behind when she was rescued by the Enterprise-B. She tells him of someone else in the nexus who could help him: James T. Kirk, who is living out his fantasy scenario of a serene life spent horseback riding and in a cabin by the woods with the company of his long-dead dog and an unseen lover. Star Trek Generations was a wasted opportunity. The monumental meeting between Kirk and Picard should have been the focus of the entire film, not this dull story about some nutty scientist and Data’s ludicrous behavior. It feels very uneven and flat. Some parts are well done while others are mundane and listless. It seems as if the filmmakers wanted to make an epic movie but didn’t know how to go about doing it. For example, the Enterprise-B got a proper, exhilarating reveal at the beginning. But the Enterprise-D, the film’s main ship, never got that beauty shot. In fact, some its effect shots look like they were lifted directly from the TV show. In another case, Picard stands up from his chair on the bridge, strikes a heroic pose and orders “Warp one, engage!”, the camera stays on Stewart stuck in that pose a second too long then clumsily pans over to a helmsman who casually taps in coordinates without any urgency. It didn’t look natural and worst of all lacked excitement. There are some cringe-inducing moments like poor attempts at humor (thanks to Data), bad use of slow motion shots, and overindulgence–particularly that saucer crash scene, it just goes on forever! Great effects but after a few minutes it’s enough already! The cinematography was also strange, many scenes onboard the Enterprise-D looked bland and the lighting left many shadows, some of which had Picard talking in the dark. Now onto the plot and characters. Supposedly writers Ronald D. Moore and Brannon Braga were rushed when they pumped out this script, which would explain all the plot holes. Start with this nexus thing and Soran. Even though its explained that a ship cannot approach the nexus, why not just maneuver an asteroid or other celestial body onto the nexus’ path? Or just wait a few years until it naturally intercepts a planet or follow it from a safe distance? Then the biggest question is this: if Picard can leave the nexus to any point in time, why not just go to the film’s beginning and toss Soran in the brig? Leonard Nimoy was offered the directing job for Star Trek Generations but declined because he wanted to change the script. Unfortunately, producer Rick Berman deferred to his writers, who were clearly overworked from having done the TNG TV show. So they went with veteran TNG director David Carson. Who knows how things would have turned out if Nimoy directed instead? The timing of the film’s release was another fault. The TV show had just finished its run a few months prior to this film. This meant that it didn’t have the nostalgia factor that the early few Star Trek films had. There was pent-up demand to see the original Star Trek characters reunited. This film is just another standard story that could’ve been from the seventh season of TNG. Paramount Studios should have waited instead of rushing Berman and company. A perfect opportunity was with Star Trek’s 30th anniversary just two years away. They also could’ve made it into a two-part movie. Part one would be primarily about the original crew to be continued with the new crew. That way, the TNG characters wouldn’t have to share screen time with the originals because let’s face it, they are outright dull in comparison. One problem is that the first twenty minutes featured some terrific characters who we can identify with, then they’re dropped in favor of lackluster characters. Patrick Stewart had the meatiest role and did well but he’s no Shatner, who had a sense of whimsy, screen presence and charm that Stewart lacked. The film is in trouble when viewers would rather watch Kirk cook breakfast than much of what went on before. At least with those domestic scenes, which humanized Kirk, we didn’t have to listen to nonsensical technobabble. Finally, there is the matter of Kirk’s death. To this day, no one wants to take credit for coming up with that humdinger of an idea. Why? It was so poorly done and unbefitting of a Starfleet legend. 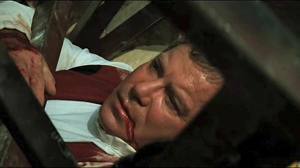 Kirk deserved a more dramatic death, maybe one where he saves the Enterprise-D as he did with the Enterprise-B. Or he could’ve just disappeared after a big explosion and his fate be left unknown, cementing his legendary status. Or Kirk could’ve just fallen back into the nexus and lived out his retirement. At least it would’ve been easier for future writers and producers to figure out a way to bring him back. Regardless, the torch was passed clumsily to the next generation of Star Trek heroes.